A new generation of African entrepreneurs and businesses is emerging. They are challenging traditional incumbents and introducing new business models and strategies that are driving domestic and cross-border growth within Africa. Kenya’s ICT companies are investing in Rwanda and are now looking to enter Nigeria, while United Bank for Africa and other Nigerian banks are rapidly expanding into other African countries. In 2009 alone, South Africa invested $1.6 billion (FDI outflows) into other African countries. In telecoms, MTN, a South African company, now operates in 21 countries across Africa, and Glo, a Nigerian mobile operator, is operating in the Republic of Benin, Ghana and Côte d’Ivoire. To better understand the profound changes underway in Africa’s business environment and how governments and entrepreneurs can open the way for more trade and investment by Africans into Africa, the Lagos-based Tony Elumelu Foundation and the Johannesburg-based Brenthurst Foundation are commissioning a series of in-depth case studies across a number of key sectors. They will highlight how intra-African commerce could propel the continent to greater economic prosperity. Africa’s statistics speak of tremendous potential: the continent is the size of China, Mexico, Europe, India, the United States and Japan combined. The population will soon surpass China’s, with a middle class as big as India’s. Africa has enjoyed more than a decade of sustained GDP growth, which has often outstripped many other parts of the world. There is frustration, however, that Africans are not reaping the rewards of the current global investor confidence as much as they should. The mass export of commodities to the East and the West doesn’t effectively facilitate the ‘trickle-down’ effect of wealth. Home-grown investments, focused on value-adding industries, are a major key to changing this dynamic. Africans still seem to choose products and investments from outside the continent. They prefer to export outside Africa rather than to trade, manufacture and add value within. Many African countries continue to trade raw materials but they don’t have the capability to refine or process, so they end up importing the finished products from outside of Africa. We need to understand what is preventing Africa from being home to value-adding and value-creating businesses. Why, for example, is Africa’s agricultural richness not generating an integrated growing and processing industry as it has done in Brazil? Africa requires an environment that facilitates investment and greater market integration. The current weaknesses – corruption, high start-up costs, poor infrastructure, and so on – are well known. But our study will also shed light on the legal, social and cultural differences within Africa that restrict cross-border investments. There needs to be integrated regional production chains within Africa where Africa’s raw materials are processed into finished goods that are traded locally and regionally. Regional trading blocs, including the Tripartite Free Trade Area, which encompasses the East African Community, the Common Market for Eastern and Southern Africa and the Southern African Development Community would thus thrive, paving the way for a Continental Free Trade Area that would produce and trade high value-added goods internally. Greater market integration in Africa will lead to a significant reduction in the cost of doing business and alleviate some of the problems associated with securing work permits and labour mobility. Over the long-term, Africa’s competiveness will hinge to a great degree on how well we educate our young people. Traditionally, the most talented Africans have sought educational advancement and careers overseas, but a combination of transformational educational technology, growing opportunities at home and the poor global economic climate could see this brain drain becoming a brain gain. Retaining talent, home grown or otherwise, is critical. Policy that enables skilled Africans to work across our borders more easily will help achieve this goal. Both the Tony Elumelu Foundation and the Brenthurst Foundation believe that Africa’s ability to engage in intra-African business will be one of the key determinants of its future social and economic development. Never have circumstances been more propitious for African business. A rise in disposable incomes, high rates of urbanisation and a fast-growing working-age population speak of an emerging class of purchasers of consumer goods, financial services and infrastructure as well as a potential source of manpower for industrialisation and agricultural development. It is time for Africans to wake up to the realities of their romance with China. Nigeria, a country with a large domestic market of more than 160m people, spends huge resources importing consumer goods from China that should be produced locally. We buy textiles, fabric, leather goods, tomato paste, starch, furniture, electronics, building materials and plastic goods. I could go on. The Chinese, on the other hand, buy Nigeria’s crude oil. In much of Africa, they have set up huge mining operations. They have also built infrastructure. But, with exceptions, they have done so using equipment and labour imported from home, without transferring skills to local communities. So China takes our primary goods and sells us manufactured ones. This was also the essence of colonialism. The British went to Africa and India to secure raw materials and markets. Africa is now willingly opening itself up to a new form of imperialism. The days of the Non-Aligned Movement that united us after colonialism are gone. China is no longer a fellow under-developed economy – it is the world’s second-biggest, capable of the same forms of exploitation as the west. It is a significant contributor to Africa’s deindustrialisation and underdevelopment. My father was Nigeria’s ambassador to Beijing in the early 1970s. He adored Chairman Mao Zedong’s China, which for him was one in which the black African – seen everywhere else at the time as inferior – was worthy of respect. His experience was not unique. A romantic view of China is quite common among African imaginations – including mine. Before his sojourn in Beijing, he was the typical Europhile, committed to a vision of African “progress” defined by replicating western ways of doing things. Afterwards, when he became permanent secretary in the external affairs ministry, the influence of China’s anti-colonial stance was written all over the foreign policy he crafted, backing liberation movements in Portuguese colonies and challenging South Africa’s apartheid regime. This African love of China is founded on a vision of the country as a saviour, a partner, a model. But working as governor of Nigeria’s central bank has given me pause for thought. We cannot blame the Chinese, or any other foreign power, for our country’s problems. We must blame ourselves for our fuel subsidy scams, for oil theft in the Niger Delta, for our neglect of agriculture and education, and for our limitless tolerance of incompetence. That said, it is a critical precondition for development in Nigeria and the rest of Africa that we remove the rose-tinted glasses through which we view China. Three decades ago, China had a significant advantage over Africa in its cheap labour costs. It is losing that advantage as its economy grows and prosperity spreads. Africa must seize the moment. We must encourage a shift from consuming Chinese-made goods to making and consuming our own. We must add value to our own agricultural products. Nigeria and other oil producers need to refine crude; build petrochemical industries and use gas reserves – at present often squandered in flaring at oil wells – for power generation and gas-based industries such as fertiliser production. For Africa to realise its economic potential, we need to build first-class infrastructure. This should service an afro-centric vision of economic policies. African nations will not develop by selling commodities to Europe, America and China. We may not be able to compete immediately in selling manufactured goods to Europe. But in the short term, with the right infrastructure, we have a huge domestic market. Here, we must see China for what it is: a competitor. We must not only produce locally goods in which we can build comparative advantage, but also actively fight off Chinese imports promoted by predatory policies. Finally, while African labour may be cheaper than China’s, productivity remains very low. Investment in technical and vocational education is critical. Africa must recognise that China – like the US, Russia, Britain, Brazil and the rest – is in Africa not for African interests but its own. The romance must be replaced by hard-nosed economic thinking. Engagement must be on terms that allow the Chinese to make money while developing the continent, such as incentives to set up manufacturing on African soil and policies to ensure employment of Africans. Being my father’s son, I cannot recommend a divorce. However, a review of the exploitative elements in this marital contract is long overdue. Every romance begins with partners blind to each other’s flaws before the scales fall away and we see the partner, warts and all. We may remain together – but at least there are no illusions. Sanusi Lamido Sanusi, governor of the Central Bank of Nigeria since 2009. Geldof, the lead singer of the Boomtown Rats, sprung to global prominence with his role in Band Aid to raise money for the Ethiopian famine. The single sold nearly 12 million copies; the Live Aid concerts raised £150m. For these efforts Geldof received an honorary knighthood and was elevated to a spokesman for African development. But the reason for the famine that catapulted him to prominence had less to do with the weather than the Ethiopian government's policy to withhold food shipments to rebel areas and to spend nearly half of its gross domestic product on the military. Aid became a tool of the counter-insurgency strategy, being left to rot or distributed according to political objectives. The same political issues shape African development choices today and these, not external activism on aid, are key to the continent's future. Regardless, Geldof still fails to understand that African development solutions, like the problems themselves, are principally domestic, and have to be founded in sustainable business logic not political gestures or NGO activism. Writing in the Observer last week, he praised Tony Blair (and Gordon Brown) for the 2005 Gleneagles G8 summit for shaping "not only our politics but that of the world" by cancelling debt and doubling aid. This act, he claims, released "tens of millions of children into schooling, setting off an intellectual stampede in the continent with the fastest-growing middle-class in the world. Aid sent money into basic health, education and agriculture, providing stability at a fundamental community level and allowing stretched societies a moment to pause … while helping governments acquire the capacity they needed to govern." The timing, he says, was critical since it was exactly at this moment the Chinese became interested in Africa and a digital take-off occurred. What aid had to do with Chinese investment and its demand for natural resources is beyond me and I suspect most other Africans. Nor has aid infused government capacity allowing cellphones to revolutionise communications and business. Indeed the latter has occurred precisely because governments are out of the way for once. It has absolutely nothing, nada, zilch to do with the western aid industry, as difficult as that is for them to accept. Regardless, Geldof claims that "I have no doubt that it is because of Gleneagles that I and colleagues were able to raise hundreds of millions of dollars to invest in Africa and create jobs". It is precisely in spite of Gleneagles and its reinforcement of a helpless continent deserving charity that private investment has been raised. Beijing's needs, not the proselytising of Geldof or Blair, has transformed Africa from a problem to be solved through aid to a commercial opportunity to be entertained through investment. What Geldof does not realise is that, while there is a role for humanitarian spending in emergencies, using aid as a tool for development is at best dubious. This is why aid agencies continually shift their methods and focus from agriculture and infrastructure to governance and back again. Such inefficiencies, along with the premium on administering aid through Byzantine bureaucracies (not for nothing has the World Bank's staffing increased from 650 people in 1960 to 10,000 today, two-thirds of whom are based in the centre of the poverty-stricken world, Washington DC) help to explain why, as the economist Bill Easterly points out, donor countries have absurdly argued to spend $3,500 annually to lift a poor person's income to above $365 a year. This is why remittances from Africans abroad, which have trebled in a decade to an estimated $60bn annually (just under double the donor flow), are a more efficient source of external financing than aid. Yet Geldof argues that "surely now the [aid] model has been proved". Nowhere does he mention the aspect of widening democracy, key to Africa's developmental and growth success and to improving governance. Little wonder. The record of development spending is that it can distort accountability of governments more than it improves governance, underwriting the very bad governance practices which are at the heart of underdevelopment. It can also discourage the development of the sectors where Africa has distinct advantages. For example aside from oil, South Sudan is pinning its hopes on what its officials say is "its virgin agriculture potential". But what inducement is there for this when international agencies say they will aid the "at least four million people" likely to experience "food insecurity" in that country in 2013? Africans themselves realise this. Which is one reason why the debate in and about the continent has shifted from perennial questions of what others can do for Africa, to one where Africa helps itself. Short-term band aids have given way to longer-term development plans, at the heart of which are local political challenges, arguments and compromises. Of course there is much to do in Africa, which Geldof glosses over in his Gleneagles glow. While the Irishman lauds the continent as the "coming economic giant", it's still a very poor place, with per capita income around a tenth of the global average, and its middle-class little more than 10% of its one billion people. Rapid population growth means that education is critical, as is providing the governance context to attract investment to create the jobs so necessary for political stability and, in a virtuous cycle, for the right policy choices to be made. For this reason Gleneagles was important. Not for being the moment that aid was doubled and debt relieved, but the moment when external largesse as the solution for African development was taken off the table. Not by Blair, Brown or Geldof, for that matter, but by Africans. At a recently held meeting of the National People’s Congress in Beijing, China’s leaders unveiled a dramatic long-term plan to integrate some 400 million countryside dwellers into urban environments by concentrating growth-promoting development in small and medium sized cities. In stark contrast to the neglected emphasis placed on infrastructure development in the United States and Europe, China spends around $500 billion annually on infrastructural projects, with $6.4 trillion set-aside for its 10-year mass urbanization scheme, making it the largest rural-to-urban migration project in human history. China’s leaders have mega-development in focus, and realizing such epic undertakings not only requires the utilization of time-efficient high-volume production methods, but also resources - lots and lots of resources. It should come as no surprise that incoming Chinese president Xi Jinping’s first trip as head of state will take him to Africa, to deepen the mutually beneficial trade and energy relationships maintained throughout the continent that have long irked policy makers in Washington. The new guy in charge - who some analysts have suggested could be a populist reformer that empathizes with the poor - will visit several African nations with whom China has expressed a desire to expand ties with, the most prominent being South Africa. Since establishing relations in 1998, bilateral trade between the two jumped from $1.5 billion to 16 billion as of 2012. Following a relationship that has consisted predominately of economic exchanges, China and South Africa have now announced plans to enhance military ties in a show of increasing political and security cooperation. During 2012’s Forum on China-Africa Cooperation meeting, incumbent President Hu Jintao served up $20 billion in loans to African countries, which were designated for the construction of vital infrastructure such as new roads, railways and ports to enable higher volumes of trade and export. In his address to the forum, South African President Jacob Zuma spoke of the long-term unsustainability of the current model of Sino-African trade, whereby raw materials are sent out and manufactured commodities are sent in. Zuma also stated, "Africa's past economic experience with Europe dictates a need to be cautious when entering into partnerships with other economies. We certainly are convinced that China's intention is different to that of Europe, which to date continues to attempt to influence African countries for their sole benefit." Xi’s visit highlights the importance China attaches to Sino-African ties, and during his stay, he will attend the fifth meeting of the BRICS, the first summit held on the African continent to accommodate leaders of the world’s most prominent emerging economies, namely Brazil, Russia, India, China, and South Africa. The BRICS group, which accounts for around 43% of the world's population and 17% of global trade, is set to increase investments in Africa’s industrial sector threefold, from $150-billion in 2010 to $530- billion in 2015, under the theme "BRICS and Africa: partnership for development, integration, and industrialization". With focus shifting toward building up the continent’s industrial sector, South Africa is no doubt seen as a springboard into Africa and a key development partner on the continent for other BRICS members. Analysts have likened the BRICS group to represent yet another significant step away from a unipolar global economic order, and it comes as no surprise. As Eurozone countries languish with austerity cuts, record unemployment and major demand contraction, the European Union in South Africa's total trade has declined from 36% in 2005 to 26.5% in 2011, while the BRIC countries total trade increased from 10% in 2005 to 18.6% in 2011. The value and significance of the BRICS platform comes in its ability to proliferate South-South political and economic ties, and one should expect the reduction of trade barriers and the gradual adoption of economic exchanges using local currencies. China’s ICBC paid $5.5 billion for a 20% stake in Standard Bank of South Africa in 2007, and the move has played out well for Beijing - Standard has over 500 branches across 17 African countries which has drastically increased availability of the Chinese currency, offering yuan accounts to expatriate traders. Indeed, and Beijing’s dragon safari is loaded with a packed itinerary, with Mao-bucks flying everywhere from Tanzania and the Democratic Republic of the Congo, to Nigeria and Angola. Xi Jinping will also grace the Angolan capital of Luanda, where China had provided the oil-rich nation with some $4.5 billion in loans since 2002. Following Angola’s 27-year civil war that began in 1975, Beijing played a major role in Angola's reconstruction process, with 50 large-scale and state-owned companies and over 400 private companies operating in the country; it has since become China's largest trading partner in Africa with a bilateral trade volume at some $20 billion dollars annually. Chinese Ambassador Zhang Bolun was quoted as saying how he saw great potential in further developing Sino-Angolan relations and assisting the nation in reducing its dependence on oil revenues while giving priority to the development of farming, service industries, renewable energies, transport and other basic infrastructure. Chinese commercial activities in the Democratic Republic of the Congo have significantly increased not only in the mining sector, but also considerably in the telecommunications field. In 2000, the Chinese ZTE Corporation finalized a $12.6 million deal with the Congolese government to establish the first Sino-Congolese telecommunications company, while the Kinshasa exported $1.4 billion worth of cobalt to Beijing between 2007 and 2008. The majority of Congolese raw materials like cobalt, copper ore and a variety of hard woods are exported to China for further processing and 90% of the processing plants in resource-rich southeastern Katanga province are owned by Chinese nationals. In 2008, a consortium of Chinese companies were granted the rights to mining operations in Katanga in exchange for $6 billion in infrastructure investments, including the construction of two hospitals, four universities and a hydroelectric power project, but the International Monetary Fund intervened and blocked the deal, arguing that the agreement between violated the foreign debt relief program for so-called HIPC (Highly Indebted Poor Countries) nations. China has made significant investments in manufacturing zones in non-resource-rich economies such as Zambia and Tanzania and as Africa’s largest trading partner, China imports 1.5 million barrels of oil from Africa per day, approximately accounting for 30 percent of its total imports. In Ghana, China has invested in Ghanaian national airlines that serve primarily domestic routes, in addition to partnering with the Ghanaian government on a major infrastructural project to build the Bui Hydroelectric Dam. China-Africa trade rose from $10.6 billion in 2000 to $106.8 billion in 2008 with an annual growth rate of over 30 percent. By the end of 2009, China had canceled out more than 300 zero-interest loans owed by 35 heavily indebted needy countries and least developed countries in Africa. China is by far the largest financier on the entire continent, and Beijing’s economic influence in Africa is nowhere more apparent than the $200 million African Union headquarters situated in Addis Ababa, Ethiopia - which was funded solely by China. China’s deepening economic engagement in Africa and its crucial role in developing the mineral sector, telecommunications industry and much needed infrastructural projects is creating "deep nervousness" in the West, according to David Shinn, the former US ambassador to Burkina Faso and Ethiopia. During a diplomatic tour of Africa in 2011, former US Secretary of State Hilary Clinton insinuated China’s guilt in perpetuating a creeping “new colonialism”. When it comes to Africa, the significant differences in these two powers' key economic, foreign policy strategies and worldviews are nowhere more apparent. Washington has evidently launched its efforts to counter China's influence throughout the African continent, and where Beijing focuses on economic development, the United States has sought to legitimize its presence through counterterrorism operations and the expansion of the United States Africa Command, better known as AFRICOM - a outpost of the US military designated solely for operations on the African continent. During an AFRICOM in 2008, Vice Admiral Robert T. Moeller cited AFRICOM’s guiding principle of protecting “the free flow of natural resources from Africa to the global market,” before emphasizing how the increasing presence of China is a major challenge to US interests in the region. Washington recently announced that US Army teams will be deployed to as many as 35 African countries in early 2013 for training programs and other operations as part of an increased Pentagon role in Africa - primarily to countries with groups allegedly linked to al-Qaeda. Given Mr. Obama’s proclivity toward the proliferation of UAV drone technology, one could imagine these moves as laying the groundwork for future US military interventions using such technology in Africa on a wider scale than that already seen in Somalia and Mali. Here lays the deep hypocrisy in accusations of Beijing’s purported “new colonialism” - China is focused on building industries, increasing development, and improving administrative and well as physical infrastructure - the propagation of force, which one would historically associate with a colonizer, is entirely absent from the Chinese approach. Obviously, the same cannot be said of the United States, whose firepower-heavy tactics have in recent times have enabled militancy and lawlessness, as seen in the fallout of the North Atlantic Treaty Organization's 2011 bombing campaign in Libya with notable civilian causalities. As Xi Jingping positions himself in power over a nation undertaking some of the grandest development projects the world has ever known, Beijing’s relationship with the African continent will be a crucial one. While everything looks good on paper, Xi’s administration must earn the trust of their African constituents by keeping a closer eye on operations happening on the ground. The incoming administration must do more to scrutinize the conduct of Chinese conglomerates and business practices with a genuine focus on adhering to local environmental regulations, safety standards and sound construction methods. The current trajectory China has set itself upon will do much to enable mutually beneficial economic development, in addition to bolstering an independent Global South - a little less red then how Mao wanted it, but close enough. The U.S. is markedly widening its role in the stepped up French-led military campaign against extremists in Mali, providing sensitive intelligence that pinpoints militant targets for attack, U.S. and allied officials disclosed. U.S. Reaper drones have provided intelligence and targeting information that have led to nearly 60 French airstrikes in the past week alone in a range of mountains the size of Britain, where Western intelligence agencies believe militant leaders are hiding, say French officials. The operations target top militants, including Mokhtar Belmokhtar, the mastermind of January's hostage raid on an Algerian natural gas plant that claimed the lives of at least 38 employees, including three Americans. Chad forces said they killed him on Saturday, a day after saying they had killed Abdelhamid Abou Zeid, the commander of al Qaeda in the Islamic Maghreb's Mali wing. French, U.S. and Malian officials have not confirmed the deaths of Mr. Belmokhtar or Mr. Zeid, citing a lack of definitive information from the field. But they say the new arrangement with the U.S. has led in recent days to a raised tempo in strikes against al Qaeda-linked groups and their allies some time after the offensive began in January. That is a shift for the U.S., which initially limited intelligence sharing that could pinpoint targets for French strikes. On Monday, French Army Chief Admiral Edouard Guillaud said Mr. Zeid was likely dead, but couldn't confirm it. "It is likely, but it is only likely. We can't have any certainty—it would be good news—because we didn't recover the body," Adm. Guillaud said in an interview on the Europe1 radio station. On whether Mr. Belmokhtar has been killed, Adm. Guillaud urged "extreme caution," as "there is always the risk of being contradicted later by a dated video." He said recent comments on Islamist Internet forums insist that Mr. Belmokhtar is alive. The elite Chadian unit fighting in Mali was trained by U.S. special operations forces who have been working in Chad, Chadian and U.S. officials said this weekend. The unarmed U.S. drones played a key role in the recent offensive in which French and Chadian forces succeeded in homing in on and ambushing a group of militants in the Adrar Tigharghar mountains of northern Mali, near the border with Algeria, French officials said. The U.S. decision to authorize the Pentagon and U.S. spy agencies to feed detailed targeting information directly to French forces came after a lengthy U.S. administration debate over how directly to aid French strikes, according to U.S., French and other Western officials. The arrangement represents a test of President Barack Obama's new strategy for dealing with the growing terrorist threat in Africa. Instead of sending American ground troops and armed drones to take direct action, the U.S. where possible will try to provide logistical, technical and intelligence support to enable local and regional partners to pull the trigger, officials say. The approach could be a model for future drone operations in a region where the U.S. has few established air bases of its own, and as a way to limit Washington's role in lethal operations, officials say. A Western official said the Adrar Tigharghar operation itself, in which the U.S. has provided targeting information to facilitate French and Chadian strikes, was an example of a new counterterrorism strategy of working "by, with and through" local forces and a "rare North Africa success story." For weeks, U.S. spy agencies and administration lawyers debated whether providing actionable intelligence to the French to facilitate strikes would make the U.S. a "cobelligerent" in a widening conflict with an al Qaeda affiliate that U.S. intelligence agencies don't yet see as a direct threat to the U.S. homeland. Administration officials initially cited concerns that furnishing actionable intelligence to the French would spur the affiliate, al Qaeda in the Islamic Maghreb, or AQIM, to start targeting American interests in the region. They were also concerned the move would make the U.S. culpable for lethal operations that it wouldn't control. Advocates of helping the French locate targets for strikes argued that providing the information was in the U.S. interest because it would bolster a key ally, reduce the risk that the French offensive would drag on and help eliminate militants of increasing concern to the U.S., including Mr. Belmokhtar. A senior U.S. official said the Americans ultimately decided they weren't cobelligerents because the U.S. was supporting the French rather than joining the campaign. In recent years, a Joint U.S. Special Operations Task Force in Africa has provided Chad's Special Anti-Terrorism Group, the unit involved in the operations last week that allegedly killed Mr. Belmokhtar and Mr. Zeid, with equipment, training and logistical support, officials say. 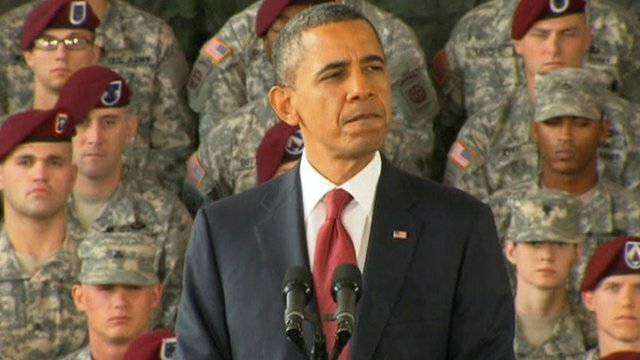 American forces didn't accompany the Chadian unit to Mali, U.S. officials said, as Mr. Obama has so far limited the American role to provide intelligence and logistical support. Chad said it has lost 26 soldiers in the Mali offensive. A senior Chadian government official confirmed that the Special Anti-Terrorism Group deployed last month to Mali and involved in the battle in the Adrar Tigharghar mountains had been trained by U.S. instructors. "We have a good cooperation with the U.S.," Chadian Minister of Communication Hassan Sylla said. Under the new arrangement for Mali, unarmed U.S. Reapers scour the deserts and mountains using their sensors to search for so-called patterns of life—communications and movements deemed by the U.S. to be telltale signs of militant activity, officials said. The Americans then pass the raw video feeds and other real time data to French military and intelligence officers who decide if, how and when to use the information. French fighter planes or ground forces sometimes swoop in to attack. The information is also shared with African forces involved in the French-led campaign, including the Chadians, officials said. In Pakistan and Yemen, other areas where U.S. has for years conducted counterterrorism operations against al Qaeda and its allies, there is no need for manned aircraft because the U.S. uses armed drones, which can both pinpoint targets and strike. Relying on manned aircraft in Mali raises the time between acquiring a target and firing upon it. France would like to buy its own fleet of unarmed American Reapers—three to start. U.S. officials said it would take time to approve such a sensitive technology transfer. As a result, French officials have suggested they may turn to Israeli drone makers instead. France's own drones, two of which operate in Mali, are less advanced and can't intercept militant communications as effectively. The unarmed Reapers now helping the French in Mali are flown out of a base in nearby Niger, which recently signed a security deal with the U.S. that set the stage for the Pentagon to expand its presence in the country. Current and former intelligence officials compared the cooperation in Mali to the way the U.S. helps Turkey target Kurdish separatist fighters along Turkey's border with Iraq. There, video feeds and other intelligence collected by U.S.-piloted Predator drones are relayed to a joint intelligence center in Ankara, where U.S. analysts sit next to their Turkish counterparts, who in turn can call in airstrikes. U.S. military and intelligence officials have long held up the fusion center in Ankara as a successful model that could be applied elsewhere to support key allies. But such arrangements have downside risks, as evidenced by a December 2011 Turkish airstrike that killed 34 civilians. A U.S. drone tracked the group before the airstrike. Dr. Nnamdi Azikiwe, the first Nigerian President used to say: “No condition is permanent.” In past decade or more, Africa with all her short comings, vulnerabilities and sufferings appeared to be in a perpetual condition of hopelessness. The disease, political unrest and poverty were making permanent residents in Africa. With these deplorable situations, Africa became a testing ground for all abstract theories and hypothesis. The Western media and financial institutions were busy running around to attend to the mundane problems of the continent, without even asking Africans to speak and say what Africa want from the West. The media was quick to treat Africa as a country and not as a continent. When a political and economic breakdown occurred in one country, it is immediately referred as an African problem. The International Monetary Fund (IMF) was quite busy roaming from one African country to another, actively doling out financial prescriptions and medicines that made the perceived patients even sicker. Africa was introduced to austerity measures, otherwise known as Structural Adjustment Program. It was an indeed an adjustment from poverty to penury, and to a more stringent life style. Economist magazine, a quintessential western media in May of 2000 chose to amplify the existential problems of three African countries namely Sierra Leone, Ethiopia and Mozambique with a captioned, “Hopeless Africa.” And the economist write-up was characteristized by barrage of put downs and condescension that the magazine later regretted. Economist at the time of the write up, forget to mention the international role blood diamond played in the Sierra Leone conflict and the ECOWAS military intervention that successfully brought to the end of the conflict. Temporary amnesia was needed to put Africa in her suppose place. Those stereotypes that Africa was always associated with: “cannibalism” and “brutality,” were slipped into the write-up and it was beginning to sound like Conrad’s Heart of Darkness. “No condition is permanent” and Africa’s dire condition has gradually but steadily changing and improving. The economic climate in Africa is becoming bright, even brighter. While the rest of the world was mired in anemic economic growth, African economy is growing at 5;3 percent for the past three years and projected to grow even more in 2013 and 2014. Nigeria, an oil-rich nation is projected to grow up to 7 percent in 2013 and 2014. Investors are rushing to Africa not for altruistic reasons but because African market offers the highest returns of any market in the world. Nigeria capital market yields higher returns more than European stock markets. While the problems of debts and deficits are gradually diminishing in Africa, many Euro-nations are mired in serious debts and deficits with bloated public sectors and insatiable thirst for spending. Africa's corruption troubles are well known, but corruption is a global phenomenon and developed countries are deeply implicated. Speaking at Transparency International's (TI) Annual Anti-Corruption Lecture, John Githongo, Kenya's former anti-corruption tsar, spoke with cautious optimism. On the one hand, he proclaimed: "Today we are witnessing a unique convergence of potentially positive developments in the fight against corruption - one that has not existed since the end of the Cold War". Yet at the same time he also emphasised that we are still facing "the continuing reality of systemised corruption". Indeed corruption is a major problem which continues to undermine institutions, economies and societies - not least in Africa. In TI's Corruption Perceptions Index 2012, 90% of African countries scored below 50, (0 being "highly corrupt", and 100 representing a lack of corruption) and Somalia was deemed to be the worst offending African country with a score of just 8, joint with Afghanistan and North Korea. But despite the picture sometimes painted, corruption is by no means a uniquely African phenomenon. In fact, taking a closer look at corruption and expanding our understanding to beyond just bribes and kickbacks enables us to see that corruption exists across the world and that even in 'African' corruption, developed countries are deeply implicated. Firstly, a closer look at TI's index shows that 70% of all countries scored less than 50 out of 100, with a global average of just 43. Corruption is a problem with which most of the world is still struggling, developed countries included. In a telling case in 2008, for example, German multinational Siemens was found to have had a slush fund totalling more than €1.3 billion ($1.7 billion) to help win overseas contracts from 2001 to 2007. The company was investigated for bribe-paying, corruption and falsifying corporate books and, after much plea bargaining and negotiating, was fined a record $800 million. This kind of corruption can sometimes also be part and parcel of African corruption in that such companies are on the lesser-examined supply side of bribes while African governments are on the demand side. In 2010, for instance, BAE Systems, one of the world's largest defence contractors, pled guilty to criminal charges regarding contracts won from countries including Tanzania and South Africa. BAE was investigated by the UK's Serious Fraud Office in a long-running case and ended up paying £286 million ($460 million) in fines. The global financial crisis, which was caused in large part by the dubious and often fraudulent activities of financial corporations, "woke us up in Africa to a new perspective of corruption", explained Githongo in his speech. "It became a matter of concerted interest among Africa's chattering classes - long accustomed to Western lectures on corruption - that this is not a uniquely African or even a Third World thing." Additionally, if we are to truly understand the challenges of corruption faced by developing countries, we must recognise that the kinds of kickbacks and bribes mentioned above - and measured by TI's indices - are just one dimension of corruption. Taking a broader perspective, we can see that while many activities may not be corrupt in terms of explicitly contravening specific laws, they may nevertheless undermine human rights, democracy and transparency. And when we recognise this, the extent to which developed countries are implicated in the problems facing Africa is brought into stark relief. There are many important examples of this, one of which is the role of governmental export credit agencies. Many Western leaders, such as British Prime Minster David Cameron, have emphasised the need to "tackle the causes of poverty, not just its symptoms". But despite this, many Western governments - through export credit agencies - support projects abroad that not only involve economic corruption but are linked to human rights abuses and the maintenance of inequality. Furthermore, to add insult to injury, they also often generate sovereign debt in the process which then constrains governments' capacities domestically. One government heavily implicated in this kind of corruption and accumulation of 'toxic' debt is the UK and its British Export Credits Guarantee Department (ECGD). The ECGD helps exporters invest in 'high-risk' projects - many of which allegedly involve corruption, environmental destruction, or arms sales leading to human rights abuses. The Jubilee Debt Campaign estimates, for example, that around one-quarter of Egypt's $150 million debt to the UK comes from loans for military equipment which was used to prop up the regime of former president Hosni Mubarak. Similarly, 11% of Zimbabwe's current debt to the UK is owed for the purchasing of 1,000 police Land-Rovers which were used in internal repression. More broadly in Zimbabwe, according to Tim Jones, Policy Officer at Jubilee Debt Campaign, "Debt has played a key role in the tragedies that many Zimbabweans have suffered over the last twenty years. Dodgy projects, debt repayments and failed economic policies contributed to economic decline." Indeed, a report by the Jubilee Debt Campaign also suggests that whilst the British government asserts that aid is conditional on the pursuit of anti-corruption measures by the recipient country, they are nevertheless providing financial support (through export credits) for deals which could involve corruption. The report explains, for example, that the agreement for the 1986 Turkwel Gorge Hydro-Electric Power Station in Kenya was alleged to have involved considerable payments to high-level Kenyan authorities. These individuals stood to gain personally from a deal whose shortcomings they were well-aware - namely, that the final contract price was more than double what the government would have had to pay through a competitive tender process, that the proposed location of the power station was on dangerous tectonic fault lines, and that the flow of the Turkwel river from which power was to be generated was unreliable. But nevertheless, the ECGD issued a multi-million dollar guarantee to a British consulting firm to work on the doomed project. The Kenyan press has since dubbed the project a "stinking scandal", and nearly 30 years later Kenya still owes money to the ECGD. In fact, crucially compounding these problems is the sovereign debt they lead to, often meaning citizens are paying for the very means by which they are oppressed or led to suffer. In Egypt, for example, $22 million will be spent this year servicing debt accrued by the Mubarak regime for military purchases. Despite a pledge by the Liberal Democrats, the junior party in the ruling coalition government, to invalidate 'dictator debts', the UK is demanding this debt be repaid despite the fact Mubarak was overthrown and widely condemned by the international community. Elsewhere, some countries including Nigeria, Lesotho and Gabon reportedly owe more than 50% of their national debt to Export Credit Agencies such as the British ECGD. And some studies have suggested that a number of countries are spending more each year on servicing their debt than they do on all public services combined. While not all of these loans are necessarily economically corrupt, they contribute to a climate of broader corruption in which moral standards are seemingly bypassed in pursuit of economic gain by developed countries. Githongo entitled his TI-UK Annual Anti-Corruption Lecture "Crossroads in the fight against corruption" - a poignant reminder that whilst the potential for change is perhaps more prominent than ever, the actions of the international community, governments and corporations can hamper real progress. In his closing words, Githongo argued that "the moment is unique, in part because the wider population, especially the youth, are demanding [reform] already". But local efforts can only be effective if they are not contradicted by wide-scale corruption at the upper echelons of public life, including at the international level. It is important that governments of developed countries recognise this demand for change and implement a real transformation in their support of developing countries. Corruption, toxic debt and dubious arms deals continue to plague developing countries, but the blame for this cannot be solely placed on those in the developing world. Instead, developed countries must look a little closer to home and realise that true change requires transparency and accountability at all levels and in all states. Phillippa Lewis is a freelance writer and a Cardiff University graduate, having completed a BA Politics and Philosophy degree at undergraduate level and a MScEcon International Relations post-graduate degree. Interests include maritime piracy, humanitarian intervention and good governance. Investments made by IFC infrastructure, health, education, and agribusiness projects in sub-Saharan Africa yielded the record results in the fiscal year 2012, making the EAC a likely beneficiary for more funding, IFC executives said. IFC Director for East and Southern Africa Jean Philippe Prosper said it aims at delivering essential services, through its projects and job creation to those deemed unqualified for the services. The results released last week showed that IFC’s investment clients benefited from $1.2 billion mobilised from other investors, and are expected to generate power for 1.54 million new customers, support 23,000 farmers, improve health services for 50,000 patients, and reach 10,000 students. The International Finance Corporation (IFC), World Bank’s private-sector lending arm, is set to increase its investment in the East African region in the coming fiscal year, after posting $4 billion in profits from Africa. IFC funding for infrastructure and natural resources projects in Africa passed the $1 billion mark for the first time last fiscal year, including investments in Tanzania’s nickel mining project in Dutwa, Kenya Airways rights issue and Rwanda’s SME tool kit dubbed “Hanga Umulimo”. IFC intends to lend 10 Kenyan companies at least $401 million in 2012-2013, with particular emphasis on energy, transit and information and communications technology sectors. Last year, IFC lent Kenya $361 million, which was 9 per cent of $4 billion it invested in 33 sub-Saharan African countries. “IFC strives to promote open and competitive markets in Africa, as reflected in our development impact and highest-ever investment figures,” he said. In Kenya, IFC put in funds in two government-tendered independent power projects: Thika power and Gulf Power Ltd.
And to make transportation of goods across the region easier, IFC and with six other finance institutions provided a $164 million financing support to Rift Valley Railways to rehabilitate the Kenya-Uganda railway line. While in Burundi it made its 100 hotel investment in Africa with a $5.5 million loan to hotel company, Opulent (B) Ltd to help improve the country’s portfolio as a business destination by providing international-standard rooms and conference facilities. In March 2012, IFC extended a $100 million loan to Equity Bank Ltd to support lending to SMEs and women entrepreneurs, and expand lending in Kenya, Uganda, Tanzania, South Sudan and Rwanda. Previously, IFC provided investment and advisory services to Bank of Africa and Diamond Trust bank to help them increase their support for SMEs in East Africa. IFC Advisory Services created 25,500 jobs and worked with other financial institutions to provide more than $1 billion in loans to African entrepreneurs in the 2011 calendar year. IFC ran a Business Edge programme, which provided management training for entrepreneurs in Uganda, South Sudan, Rwanda, Kenya and Burundi. I had not intended to come back to the Africa Rising debate for a while. But on my recent trip to Nigeria, Kenya, Tanzania and Uganda I was shocked at how angry the young professionals are. These are highly educated, ambitious young men and women who could be found working in the corporate sector anywhere in the world. They should be taking Africa to the Promised Land. Instead, I found them frustrated and furious with many calling for coups and revolutions. Coming from London where we had been basking in a warm bath of Afro-optimism, I had expected to find a similar feeling in Africa itself. Growth has remained strong despite the economic problems in Europe, Africa’s biggest trading partner, and the prices for the continent’s abundant commodities have remained high. Governance is said to be improving. Firstly, has Africa’s growth been driven by a long commodity boom or is it now self-sustaining? Where is the large scale manufacturing? Secondly, has governance really improved? Are the figures about numbers in school, clinics being built, power, water and sanitation delivered true? Thirdly, are there two Africas? One in a bubble of western-style wealth inhabited by the rich and powerful and another Africa on the other side of the security fence – barefoot, one torn shirt, no money, no prospect of a job – “suffering and smiling” as Afro Beat musician Fela Kuti sang, but with big and increasingly angry eyes. What shocked me in Lagos, Kampala and Nairobi was the fury of the young middle classes – the very people who are supposed to be driving the new Africa into the 21st Century. They were angry about the poor levels of education, about the lack of electricity, but above all about corruption at the very top. And they see the growing ranks of ill-educated, unemployable young people being churned out of badly-managed state education systems. In Nigeria, they have all but given up on the government. But what about people such as Lamido Sanusi, the Governor of the Central Bank, and Ngozi Okonjo-Iweala, the Finance Minister? I pleaded. Their reply was: Of course, they do what they can but their space is limited. They are not allowed anywhere near the real money – the oil. That, I was told, was managed in complete secrecy by President Goodluck Jonathan and the Vice-President and the oil minister, Mrs. Diezani Alison-Madueke. They are filling a huge war chest so that Jonathan can run for president again in 2015. Two remarks struck me. One was how utterly out of touch the President is. When street protests broke out a year ago in reaction to the sudden removal of the fuel subsidy, he claimed that people were being paid to demonstrate. My informant pointed out that all the evidence was that people had reacted in spontaneous fury to the government’s removal of the only benefit it delivers to the Nigerian people. Yes, the only one. One said: “I am extremely optimistic about the future of Nigeria – once there has been a revolution and the current ruling elite is removed”. No one in the room showed dissent or even surprise. In Uganda, the entire middle class – except for those in government – realises that the country is heading for a crash or a coup. Even President Yoweri Museveni himself warned that if his own ruling party does not stop bickering, the army may step in. That is the most extraordinary statement I have ever heard from an African president. The reaction of many Ugandans (under their breath) was: “Bring it on”. Museveni has stayed too long and he has cultivated no obvious successor. He is trapped, talking now about installing his deeply unpopular wife and or his son in his place. Twenty seven years ago he did a good job and ruled well (except in the north) and this lasted for a decade. But now he has turned into the very president he criticised so severely as a young man – the one who stays too long in power. Meanwhile, in Nairobi the population is battening down the hatches for the election next month. Most are optimistic that their new constitution will curtail the worst excesses of the professional politicians, although these people still made up about 80 per cent of the winners in the recent party primaries. So, where exactly is The New Africa flourishing? Botswana? But it was always successful and never suffered from the political and economic catastrophes that hit Africa in the 20th Century. The fact is that the five big African countries: Egypt, Nigeria, South Africa, Angola and the Democratic Republic of Congo are in political turmoil or stasis. None of their governments has the vision or the capacity to position their countries to develop rapidly and sustainably as Indonesia, Malaysia and China have. The good things that are happening in many African countries – with the possible exception of South Africa – are happening in spite of their governments, not because of them. Secondly, two of the most successful countries in terms of human development – Ethiopia and Rwanda – are dictatorships which allow minimum democracy and freedom of speech. This makes it difficult for Western governments to support them. Aid has been cut to Rwanda and if the next election in Ethiopia is not free and transparent, Western allies and donors may have to turn a blind eye or step away. Some countries are doing reasonably well: Ghana, Senegal, Namibia and Zambia are OK. Cameroon and Gabon are quiet but not dynamic, still run by small wealthy elites who do not spread the new wealth. Cote d’Ivoire has emerged from its civil war and Somalia may bounce back quickly if the new government is strong enough to crush al-Shabaab and smart enough to manage clan politics. But meanwhile, Mali, a former favourite of western countries, has imploded and both Sudans are in an increasingly bad way. It is hard to imagine Mauritania, Niger and Chad will not also be affected by Islamic militancy. China has been the main player in Africa’s economic transformation, but how long will it be before Africans react against the growing power and exclusive behaviour of the Chinese and their total disregard for Africa’s environment and culture? Africa rising? Bits of it yes, but watch out for Africans’ rising anger. - Richard Dowden is Director of the Royal African Society. During the past 30 years tourism has been one of the fastest growing industries in Africa, so much so that it has become an important driver of economic growth and a key strategy for regional cooperation among African economies. Though Africa has been blessed with abundant tourism resources, the industry was previously largely confined to North Africa. The real impetus for the industry came during the 1970s when sub-Saharan African destinations started appearing in tourist itineraries. Since then the industry has gone from strength to strength and Africa is a must-see destination for most global travelers. Looking at tourist footfalls over the years, it is not surprising to see that Chinese tourists to Africa have not only played a big role in the development of tourism, but also risen significantly in numbers in the past few years. As far as Chinese tourists are concerned, the biggest growth has been spurred by the deep pockets of the rising middle-class population. According to industry estimates, there are 17 African destinations that are quite popular with Chinese tourists. The most sought-after African destinations are the tourist attractions in Egypt, Kenya and South Africa. However, some Chinese travel agencies have recently added Zimbabwe, Mauritius, Seychelles and Tunisia, with most of the attractions catering to the tastes of middle-class tourists. 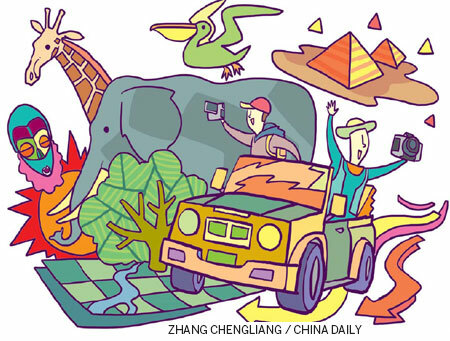 There are four reasons as to why more Chinese tourists are now flocking to Africa. First, the continent's natural landscape, warm people, long history and rich and unique flora and fauna have captivated many Chinese tourists. For most of these tourists, Africa is a captivating destination that has no parallels in Europe or the US. Undoubtedly there is a growing desire among Chinese tourists to build closer relations with their African brethren. With the continuous improvement of education levels, especially the growing popularity of English education, middle-class tourists from China, especially those from the second and third-tier cities, are increasingly opting for "do-it-yourself" itineraries in Africa. These tourists do not want to be confined by the rigid package tours of travel agencies, and instead want to explore the vast continent's forests, snow-capped mountains, volcanoes, rivers, swamps and deserts in their own way and interact with the African people. The annual Forum on China-Africa Cooperation and other major meetings also promote and motivate more tourist flows to Africa. The second major reason for growing tourist numbers is the good connectivity and easy timing of travel to most African destinations. With the deepening of China-Africa relations and the development of economic and trade ties, most of the major African carriers have started non-stop flights to Hong Kong and the Chinese mainland. It takes only 10 hours from Mauritius to reach Hong Kong, similar to a non-stop flight from Beijing to London. In addition, destinations like Johannesburg, Nairobi, Cairo and Addis Ababa are connected through daily flights from Hong Kong, Beijing and Guangzhou. In other words, in 12 to 14 hours a Chinese tourist can reach Africa. The extra emphasis that most African countries are putting on tourism development is the third major factor for more tourist flows. In addition to the multiple-entry visas for Chinese tourists launched a year ago, many African countries now have reduced their visa processing period to between five and seven days. This makes travel to African countries easier and faster. Compared with traditional European and US visa procedures, Chinese travelers only need to submit some basic information to African embassies. African countries have no demanding requirements over proof of property ownership, financial guarantees and personal privacy. African countries such as Benin and Mauritius have even accorded a visa-free status to Chinese tourists. Tourism bureaus in many African countries have developed publicity strategies tailored specially to the Chinese market. Some African countries use their celebrities and new media to attract tourists. Others like Egypt, Kenya and South Africa have increased their advertising exposure on China Central Television and several other provincial TV stations to draw more Chinese tourists. Growing health awareness is the fourth and most compelling reason that is helping grow tourism in Africa. Most middle-class tourists from China are those who live in the cities and hence do not get much chance for outdoor activities like mountaineering, parachuting, trekking in the tropical rainforest, desert adventures and cross-country competitions. Africa has all of these and many more other attractions. Due to natural and historical reasons, many countries in Africa have gone through long periods of underdevelopment. The financial, material and technical conditions are often weak and the transportation system is not perfect. Despite the rich tourism resources, the lack of sufficient human, material and financial resources has often hindered large-scale systematic development. It is difficult to carry out effective marketing for existing tourism resources, resulting in a considerable number of high-quality tourism resources not living up to their names. Africa has not yet formed a complete transportation network. Though its international ocean shipping network is relatively comprehensive, it is still limited mostly to the eastern coastal regions that are closer to the Eurasian continent. In recent years, the aviation industry in Africa has been growing rapidly, but the number of connections between African countries and other countries is still limited. Airports with large passenger aircraft are mostly concentrated in a small number of relatively developed countries and cities. As far as road traffic is concerned, most of the intra-African traffic lines extend from the coastal ports, but some of these highway systems are out of date and easily jammed, thereby posing challenges to travel. Tourism plays an irreplaceable role in promoting employment, reducing poverty and improving foreign exchange earnings. Due to the lack of funds and the lack of development in the service economy, scenic construction, tourism product development, tourism facilities and service standards show some deficiencies, and have more room for improvement in terms of food, accommodation, transportation, shopping and entertainment. Africa is also home to thousands of languages (of course, the main languages are French, English, Portuguese and Arabic). Multilingual tour guides are rare in Africa, with tour guides who can speak Chinese even harder to find. Natural disasters and occasional armed conflicts in Africa, coupled with its lack of financial and human resources, also pose a threat to many of the world heritage-listed sites in Africa. Although the number of world heritage sites in Africa accounts for 13 percent of the global total, in terms of endangered World Heritage sites, Africa accounts for more than 50 percent. Overall, with its unique tradition and culture, the continent is bound to attract more Chinese tourists. Zhang Qizuo is professor of economics and vice-president of Chengdu University, who specializes in China-Africa trade and investment.